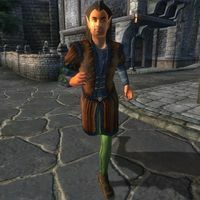 Glarthir is a Bosmer commoner living in Skingrad who believes that he is constantly being watched and conspired against. He believes that Bernadette Peneles, Toutius Sextius, and Davide Surilie are in on the plot against him. To end this, Glarthir will attempt to enlist your help, initiating the quest Paranoia. Glarthir will always detect and actively seek you out the first time you visit Skingrad, but his regular schedule is more peaceful, at least on the surface; he wakes up early every morning at 5am and immediately heads down to the Great Chapel of Julianos, hoping to catch a glimpse of Bernadette Peneles on her way to her morning prayer. At 8am, he crosses the eastern bridge of and wanders innocently around near the East Gate, secretly keeping an eye on Toutius Sextius when he leaves for the Castle. At 10am, he generally wanders around the southern part of town, keeping mostly to himself but also keeping an eye on Davide Surilie when he returns home for lunch at noon. From 2pm until 9pm, he stays inside his home, wandering around. He then eats a two-hour dinner until 11pm, before heading to bed. After talking to you, Glarthir will break off this routine and wait for you behind the Chapel every night between 10pm and 2am. There are some minor exceptions to this schedule during the quest, depending on how you choose to help Glarthir out. See the rampages section for details. He wears a set of middle-class clothing consisting of a russet felt outfit with a pair of pigskin shoes. He carries his key, three lockpicks, and a very large amount of gold. If you ask around town about him at the beginning of the quest, the people will say he's strange. Some might say: "I don't mean to gossip, but he is more than a bit strange. However, he's always been tolerated as the town eccentric." The guards may say: "Glarthir? Total nutcase, if you ask me. But he's never done anything -- yet -- that we could arrest him for." Else God-Hater doesn't think much of him: "He's a raving lunatic. I'm assuming you're asking because he's done something strange. Like what? Oh, like shouting obscenties [sic] at you, or wearing only fur for an entire year, or waiting outside your house every morning. Not that you'll get anyone else in town to admit it. 'Oh, he's harmless, we're used to him.' Harmless, ha! One day he'll snap. Then watch out." Erina Jeranus will comment: "How to say this nicely? He's sort of the town eccentric. Lived here for years, we've gotten used to his ways. Although ... lately he's been weirder than usual. Always looking over his shoulder, writing in his little notebook. I wonder what he's up to now." 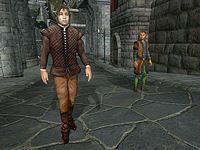 After your first conversation with Glarthir, town guard Captain Dion may come up and question you about him, asking: "A little bird told me that you've been asking around town about Glarthir. Our resident 'eccentric.' I'd like to know why." "Glarthir is crazy. Maybe harmless crazy, maybe not." If you tell him you're just curious, Dion will warn you: "Fine. Play it that way. Let me give you some friendly advice. Glarthir is crazy. Maybe harmless crazy, maybe not. Don't get involved with him. If he asks you to do anything... strange... you come see me first, got it? Or any of the town Guard. Let us handle it." If you tell him about your involvement with Glarthir, he will say: "Let me give you some advice. Glarthir is crazy. So far harmless crazy, but I keep an eye on him because it's my job to. You don't want to get involved with him. I don't care how much he's paying you, it isn't worth it. Like I said, he's crazy. Since you were courteous enough to tell me the truth, I'll do the same by trusting you to talk to a guard if he asks you to do anything... strange." If you tell him it is none of his business he will reply: "It is my business. Allow me to introduce myself: Captain Dion of the Count's Guard, at your service. Now, you were telling me why you're interested in Glarthir." You may also hear NPCs talking about him, saying: "I think Glarthir is having one of his bad spells lately, have you noticed? ", "Something is just a bit off about Glarthir. Someone needs to keep an eye on him. ", "Old Glarthir is a bit out of his mind, I think. He's convinced everyone is out to get him." or sometimes "Glarthir is acting even stranger than usual, don't you think?" Some possible responses to this are: "He is a bit nutty. Probably just a harmless old fool, though." or "He's got some issues, that's for sure. Personally, I'd just steer clear of him." The first time you arrive in Skingrad you will probably notice the wood elf following you around, whispering: "Psst. Over here! ", and simply "Over here!" He will continue saying the second line until you look towards him, at which point he will say, "Yes, you. We need to talk." He will then walk over and initiate dialogue with you: "We can't talk here. Too public. Meet me behind the Great Chapel at midnight. Don't let anyone follow you. I'll make it worth your while." If you approach him now before the scheduled meeting, he will say one of two things: "Umm ... no time to talk." or "Can't you see that I'm very busy?!" Actually speaking to him will have him lose it: "I told you not to speak to me in public! We'll meet tonight, at the place we discussed. Ah, sorry, I have no idea what time it is." or "You fool! You'll ruin everything! We can't be seen talking together! Um, no, I don't know the way to the Imperial City. You'll have to ask someone else." If other characters try to initiate dialogue with him, he will only say: "Yes. I mean ... I must go now. But do accept my apologies for your loss." or "Just leave me alone!" Glarthir will now return to his normal schedule, but will go to the meeting place behind the Great Chapel every night from 10pm to 2am until the quest is over. If you miss a meeting with him and speak to him in the street the next day, he will say: "We can't be seen talking! I waited for you last night behind the Great Chapel, where WERE you?! I'll meet you there tonight. Yes, the Gold Road does pass through Skingrad. I, too, find it fascinating." When you go to the prescribed meeting place, Glarthir will initiate dialogue: "Ah, you came. You're sure you weren't followed? Good, I thought I could trust you. Nobody else in town. They're all in on it ... all watching me. Well. Yes. I need you to do something for me. I'll pay you -- gold. You like gold, don't you? Lots of gold. Here's my problem. I'm being followed. Watched. Marukhati Selectives, maybe. Not sure. I'm a threat, you see? To their plans. I know too much. I need you to check out some people for me, the ones that are following me. Watch them, see where they go, who they report to. Will you help me?" If you decline, Glarthir will go on a rampage and attempt to kill the three suspects himself. 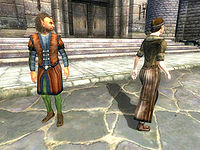 If you accept to help him, Glarthir tell you about the first of three conspirators, beginning with Bernadette Peneles. If you agree to help him with his problem, he will be happy and give you your first assignment: "Very good, you won't be sorry. I'll pay you well, did I say that already? Let's start with Bernadette Peneles. Be outside my house at 6 am, you'll see her watching me. See where she goes and who she reports to. We'll meet here again tomorrow night. Oh, and NEVER contact me in public. They're watching. They can't know you're helping me." If you ask him about Bernadette now, he will say: "Her house is almost directly across the street from mine, southwest of the Great Chapel. Coincidence? I don't think so." You can also ask him about Skingrad: "There's so much I could tell you... so many secrets... but then you'd be in danger, too. It's best if we're not seen talking." He will bid you farewell with: "Remember. Bernadette Peneles. 6 am. Don't let her see you watching!" He will then head home and refuse to talk to you, still trying to act innocent with his "Ah, sorry, I have no idea what time it is." act. Bernadette doesn't seem scared of him either: "Well, I know he's a bit odd, but I've always thought he was kind of sweet. Lately, though, he has been stranger than usual. I think maybe he's been following me. I see him every morning on my way to Chapel. I've tried to say hello but he always pretends not to hear me." -10 disposition "Ah, of course. The gold. Here. But there is someone else I need you to investigate." Later on, he will reflect on Bernadette depending on your feedback. If you said she was spying or if she's dead he will say: "I always suspected she was watching me. Thank you for finally confirming it. ", or "I still can hardly believe she wasn't watching me. But it is a relief to be able to finally stop worrying about her." if you said she was clean. "Eyes in the back of his head, always seems to know when I'm watching." He then has further instructions: "Toutius Sextius, do you know him? A quiet fellow, appears harmless enough, but I've identified him as one of my key suspects. He's a clever one, no doubt about it. Eyes in the back of his head, always seems to know when I'm watching. But that's where you come in. You should wait outside his house and see what he does when he's not watching me. I'll meet you here tomorrow night to get your report." You can now ask him about Toutius, and he will say: "He lives in the large house between the Low Gate and the East Bridge. Alone -- suspicious, don't you think?" He will also now say goodbye with: "Don't let Toutius Sextius catch you following him. He's much more dangerous than he looks!" Toutius doesn't even know who Glarthir is: "I'm sorry, but I don't think I know any Glarthir. Wait, do you mean that strange Wood Elf that you see wandering around the city? Yes, I've seen him, but never spoken to him. He seems to be at the Low Gate every morning when I pass by on my way to the castle. Gives me the strangest looks, now that you mention it. Almost like he hates me, although I have no idea why." At the next meeting you attend, Glarthir will again initiate dialogue eagerly: "Tell me what you learned about Toutius Sextius." There are several possible paths here. -10 disposition "Yes, the gold that you value so highly. I wonder, what price betrayal ... never mind that. We shall see ... I do have one more name for you." Bernadette guilty or dead "So he really is innocent, then. Interesting ... perhaps they have been using him as a decoy, to draw my attention away from their real spies ..." "Yes, of course, here is your precious gold. Now I need you to investigate one more person for me." +15 disposition "Yes, of course, here is your precious gold. Now I need you to investigate one more person for me." +15 disposition "Here you go, my friend. Trust me, you've earned it. There is one last person that needs looking into, though." Glarthir will then task you once again. Later on, you can ask him about Toutius Sextius and his response will differ depending on your investigation. If you told him Toutius was guilty he will respond: "Thanks to you, his sinister plans have now been revealed to me." If you said he was innocent, he will say: "I was sure he was part of the conspiracy. Sure of it. I guess it just goes to show ... well, we'll see what it goes to show, won't we?" "The Surilie house is right next door to mine. A large house with a backyard conveniently located to observe my every move." "Do you know Davide Surilie? Yes, of the famous Surilie Vineyards. Pillar of the community, et cetera. Who would ever suspect him? Perfect cover for the ringleader of the whole conspiracy! He watches my house constantly. You'll see. He leaves his house early each morning. Watch him and report back to me here, at midnight as usual. Make sure he doesn't notice you!" If you now ask him about Davide, he will give you some information: "The Surilie house is right next door to mine. A large house with a backyard conveniently located to observe my every move." He will say goodbye with: "Be careful. Davide Surilie is the ringleader. You must NOT let him catch you watching him!" 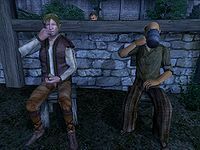 Neither of the Surilie brothers will think that Glarthir is dangerous: "You may have heard that he's a bit touched in the head, and that may be true, but he's always been a quiet neighbor. Never given us any trouble." The next meeting with Glarthir has the most possible outcomes depending on your choices previously. 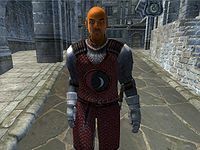 First, Glarthir will greet you with: "So, what did you discover about the upstanding Davide Surilie?" -10 disposition "And to think I trusted you!" quest completed "You certainly earned this. Take it with my thanks. I believe it must have been fate that brought the two of us together. Goodbye." -10 disposition "Here's the gold, as promised. I always pay my debts, and then some. Do the last .. task ... in that note, and I will pay you much, much more." +15 disposition "Here's the gold, as promised. I always pay my debts, and then some. Do the last .. task ... in that note, and I will pay you much, much more." gives you list of death "Here's the gold, as promised. I always pay my debts, and then some. Do the last .. task ... in that note, and I will pay you much, much more." During your investigation of Davide Surilie, and depending on your feedback on all three suspects, Glarthir will scribble down something on a piece of paper, a conditional List of Death, which includes the persons you deemed guilty. Bernadette Peneles, a peaceful vintner, will be horrified: "Julianos preserve us! I can't believe it ... why me?! Please, show this to the guards right away!" When asked again, she will ask: "You look concerned. Is there something you want to tell me about Glarthir?" and "Thank you for warning me about him. Please, hurry and tell the guards before it's too late!" Toutius Sextius will be equally scared of the crazy Bosmer: "What?! This is ... unbelievable! Of all the strange fates, to become the target of a stranger's madness ... Please, you must show this to the guards at once. My life is in your hands!" On subsequent meetings he will add: "I appreciate your warning. I'll be on the lookout for him. But please tell the guards so they can arrest him before he attacks me!" Davide Surilie (and, for obvious reasons, his brother Gaston), will react differently and less peacefully: "So he has finally snapped! I knew we should have warned the guards back when I noticed him trying to break into my house ... This has gone far enough. It's past time I dealt with this madman once and for all." Once you have shown one of the brothers the note, both of them will set off at a running pace and dispose of Glarthir once and for all. Guards will do the same as the Surilie brothers, and will say: "Damn! He's finally gone completely bonkers! Thanks for the tip. Now stand aside and let the Guard do their work. ", which will once again result in Glarthir's death. If you choose to obey orders and kill everyone on the list of death, an anxious Glarthir will approach you and say: "Have you... done... what I asked?" If you have disposed of the suspects he will be elated: "Really? He's/She's/They're really dead?! Thank you, thank you, thank you! I'm free, I'm finally FREE!" When you inquire about your final reward, he will say: "By all means. I would have paid any amount to be rid of those watching eyes, always watching me ... but never again! Ha ha ha! I'm FREE!!" At this point he will give you 1000 gold, his disposition will increase by 30, and the quest will end. Whenever the quest ends, Glarthir will leave the Generic Owner Faction if he has joined it. After the quest, he may greet you on the street with any of the three lines: "I don't really feel comfortable talking to you right now. ", "Leave me alone! I can't talk right now! ", or "Yes, I think ... no. Wait. Never mind. I must go now." If at the first meeting you don't agree to help, Glarthir will say: "Oh, well... I, I understand. The danger is too great. You're right, you should stay out of this. I'll just have to solve this myself." He will then proceed to go on his rampage. He will receive a disposition hit of 10 towards you, his house will unlock, and he will be added to the Generic Owner Faction. He will then receive a 20 point boost to his disposition towards you and his aggression will increase to 20. Bernadette, Toutius, and Davide will then be added to the People Glarthir Hates Faction, which decreases Glarthir's disposition towards them by 100. He will head to his house to get his axe from his bedroom, and then find and kill all three of his enemies with Bernadette first, then Toutius, and finally Davide. If you are not in the same cell as them when Glarthir finds them, they will automatically die and he will move on to the next one. While on any of his rampages, if you try to speak to him he will say: "You said you wanted me to solve this myself. And I am. Drastic measures. Didn't want to, but you're right, it is the only way. Um, no, I don't know the way to the Imperial City. You'll have to ask someone else." If you stay near him he may say any of the following lines: "Just have to take matters into my own hands. The only way now. ", "They think I don't know. They think I don't see. ", "I'll show them. I'll make them pay. ", "They gave me no choice. I'm not a violent person, but I can only be pushed so far. ", "It must be the Maruhkati Selectives. All the evidence points to them. ", "Could be the Blades. They've always feared me. ", "Maybe the Mythic Dawn, or the Ayleid Revivalists? ", "My enemies think I'm weak. That I'll never act." When in battle with any of the three victims, he will randomly shout: "Die! Die! Die! ", "I'll never serve you! ", "You thought I was weak, didn't you?" or "Did you think I would be your puppet?!" If the guards intervene, he will shout: "You'll never take me alive!" Once the quest is over, if he killed any of the three victims, you may hear around town: "Hadn't you heard? He went crazy and killed Bernadette Peneles, poor girl. ", "It's unbelievable. Glarthir went after Toutius Sextius with an axe. Killed him before the guards could do anything. No one even knows why." or "You must not have heard. He went crazy and killed Davide Surilie with an axe! Nobody can figure out why." If he killed all of them, you may hear: "It's too bad nobody stopped Glarthir before he went on his killing spree. I guess no one knew how crazy he really was." If he was killed before managing to attack any of his targets, people may say: "Did you hear? He went crazy and started attacking people with an axe! Luckily the guards stopped him before he killed anyone." If you killed him yourself early on, or if you let the Surilie Brothers do the deed, people will say: "He turned up dead... I guess someone finally got tired of his crazy behavior." If you showed the guards the List of Death, they will reflect: "Sad story. But at least we stopped him in time, thanks to you." Some NPCs will gossip among themselves: "Did you hear about Glarthir? Thank the Nine that the guard stopped him before he killed someone!" If after the quest Glarthir is still alive, people will simply say: "The town eccentric. Lives in the big house on the corner, southwest of the Chapel. Don't worry, he's harmless." After your secret meetings with Glarthir, and because his Chapel package runs past midnight, the AI gets confused and will send Glarthir back to the Chapel the moment he enters his house, ready to progress the quest. This basically means that the quest can be completed successfully in only one night. If you kill any of the suspects before Glarthir has asked you to spy on them, the quest will end, and Glarthir will wait for you behind the Chapel between 10pm and 2am indefinitely. Because Bernadette and Toutius are automatically added to a nonexistent List of Death when you confirm them as conspirators to Glarthir, killing any of them will forward the quest to either stage 51 or 53, making Glarthir hand over the final reward much quicker than intended. After talking to you about Davide Surilie, Glarthir is supposed to equip his axe at 9pm and carry it on him at all times, as a precaution. He may only do this if you are trespassing in his home at the time or nearby outside it. 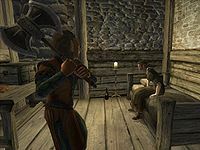 The iron battle axe in the cupboard on the second floor of Glarthir's house is one of the items affected by Duplicate Respawning Items glitch. If Glarthir is killed during the quest, residents of Skingrad may continue to talk about him as if he were alive. This page was last modified on 14 June 2018, at 20:09.